I'm generally strict with myself when it comes to sock projects. I know that I would readily fall victim to Second Sock Syndrome if I didn't limit myself to one pair on the needles a time (although that doesn't explain why I have 4 pairs of size one needles.) I cast on for the first Embossed Leaves (from Favorite Socks ) on April 4th and finished it two weeks later. The second sock? It took me three weeks to finish just the twisted rib cuff. Fearing that it might languish in the bottom of my knitting bag for another month, this morning I poured some coffee and took the sock outside. The weather in Texas is steadily heating up and soon time outside midday will not be feasible. This morning at 32°C (89°F) the backyard was perfect and I want to enjoy it while I can. I drank my coffee, took some photos and finally finished the leg of the second sock. Before I turned the heel on the second Cable Rib sock, I had the Husband try the first one on to ensure a good fit for a man's foot. He commented on their squooshyness (although I think he used a different term) and said, "you know, down the road I'd like a pair of socks like these. They feel great." My heart raced a little. Did he just slide in a request for handknit socks? Holy freakin' moses, I'd better get knitting. I didn't want this opportunity to pass me by. While I finished the rest of the foot on the second sock, I kept thinking about his request. What yarn? What pattern? Should I make them kickin' around the house socks like these? Do I make something that he could wear with his Docs? What colour? So many choices! After the photo shoot he took them off and lamented, "these were for Dad? 'Cause you know, I realllllly like them, and they fit, and they're good on the tile floors, and, and, and..."
And as it turns out these are his perfect socks. I don't have to decide on a yarn or pattern at all. They were intended for his father's birthday back in January, but the recipient will be the son and not the dad. Who can resist a plea for handknits from a Husband? Sorry FIL, you'll have to wait for the next pair. 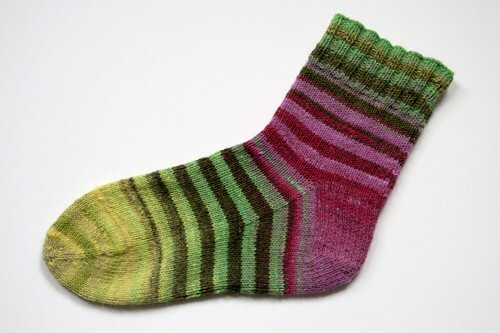 Yarn: Socks That Rock Medium Weight in Monsoon, from the Rockin' Sock Club kit. Final Verdict: I wouldn't knit these socks to wear with shoes, the cable is too thick. It creates a big 'ol bump that would press on your foot. 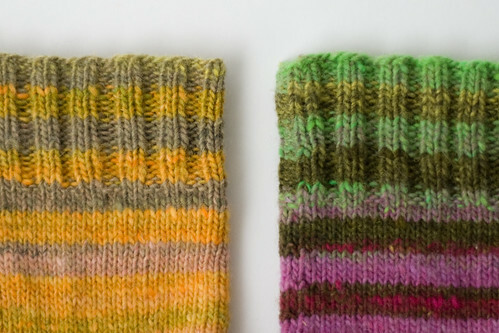 If I knit these again, I'll rework how the cable twists when you rejoin for the gusset. Knit the way it's written half the cable disappears and then is picked up with a different rib. I like my cables to have a proper start and end. And because I know it will be asked, his tattoos are Edward Gorey drawings. Mr. Mistoffelees on the left and the Doubtful Guest on the right. In all the upheaval of house renovation (new entry doors, no bathroom and random painting,) I have been knitting. Not a tonne, but a little. March seems to have evaporated and I'm not sure I have anything to show for it except a few inches of sock cuff and a thin film of dust throughout the entire house. These socks are a gift knit and are way overdue. We're talking end of January overdue. 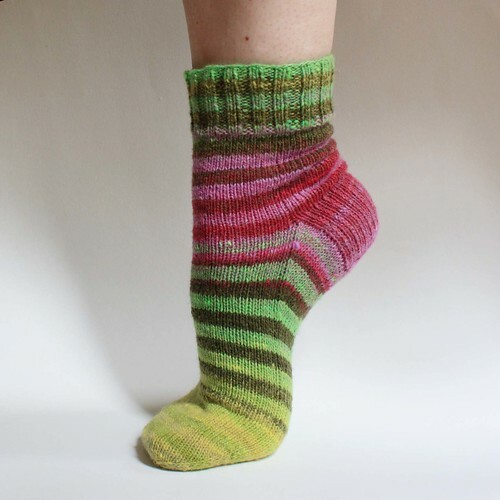 They originally began as a garter rib out of green Sophie's Toes but they have magically morphed into the Cable Rib Socks (from Favorite Socks ) in Socks That Rock. I'm sincerely hoping that the squooshyness of the STR will make up for the belatedness of the birthday present. Think I'll be forgiven? 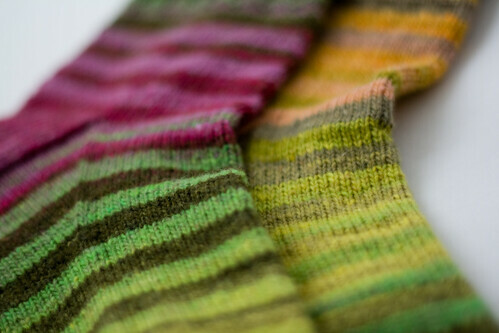 The Vesper Aquamelon socks are finished. I started the first sock three days before New Year's Eve and cast off at 10 minutes to midnight. My intention was for the first sock of the pair to be the last FO of 2006, and the second sock to be the first FO of 2007. Didn't quite work that way as the last 10 rows of this sock waited almost a month to get finished. Whoops! Yarn: Vesper Sock Yarn in the Aquamelon colourway. Final Verdict: I always take my time to make sure that I cast on at the exact same point in the colour repeat so that the stripes will match up perfectly. I did that with this pair, but I forgot that I altered the toe so that two red stripes finished on the first one. I only noticed when I was editing the pictures, so I'm pretty sure I'm not going to go back and reknit the second one to match. They can remain fraternal twins, I'm ok with that. Yarn: Vesper Sock Yarn in the Strange Little Mama colourway. 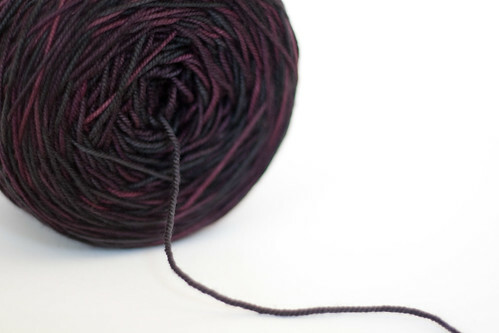 How do you get yarn named after you? So cool. 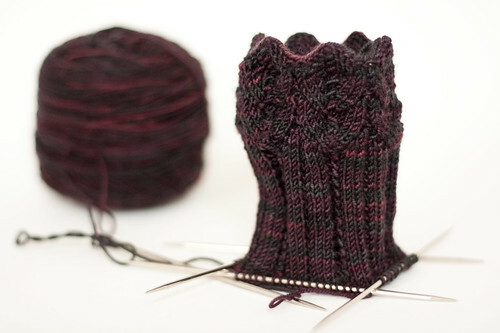 Modifications: The first sock was knit with the one by one ribbed cuff. 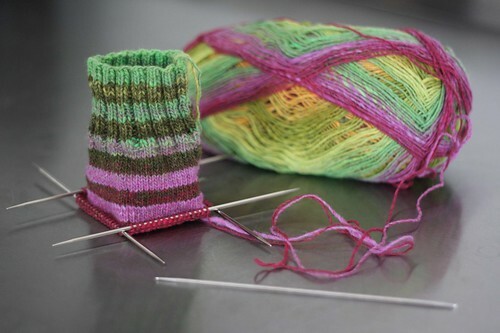 When I started turning the heel I decided I didn't like it, so I knit the second sock with a two by two rib. I like it much better, even though it makes the socks fraternal rather than identical. Finished: October 26th, 6 days behind schedule. I may have been distracted by Clapotis along the way. Final Verdict: I took my time making sure the stripes would line up the same so I get a kick out of the fact that the cuffs don't match. When Lolly asks, who can resist? 1. When did you start making socks? Did you teach yourself or were you taught by a friend or relative? or in a class? I cast on for my very first sock on January 1st of this year. (A pair of Jaywalkers in Socks That Rock, very fitting for a sock begun on January one, doncha think?) I didn't have any one teach me, I just printed out the pattern and cast on. 2. What was your first pair? How have they "held up" over time? I finished the second sock in March and immediately gave them to my mum for her birthday. Because she lives in BC, I don't know if she's worn them other than when I was in the room. Hey Mum? How do you like your socks? 3. What yarns have you particularly enjoyed? The Socks That Rock yarn was fantastic. Sproingy and soft, gorgeous colour. (I have a hankering to pick up a little more.) 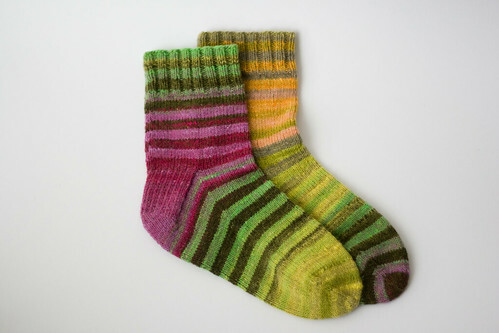 I'm currently in love with the Vesper self-striping, Julia does an amazing job with the stripes and colour combos. The only other sock yarn I've tried was the Lorna's Laces Shepherd Sock. I found it kind of meh, it felt a little flat to me. Maybe I was spoiled by the STR? 4. Do you like to crochet your socks? or knit them on DPNs, 2 circulars, or using the Magic Loop method? 5 DPNS for me. 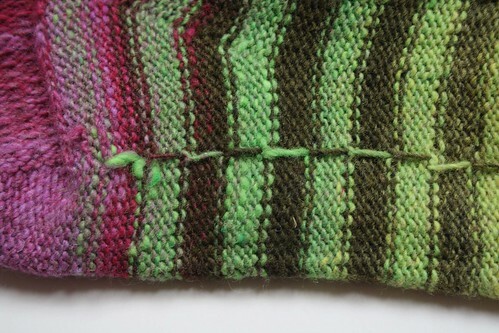 I like that when you have the sock spread over 4 needles the project will fold up flat to fit in your purse. I also like that it reduces the chances of ladders and doesn't put as big a strain on the yarn on the corners of the triangle like knitting on 3 does. So far I've only tried the flap but the next pair will be short-heels, most likely knit toe-up. Might as well try it all, right? 6. How many pairs have you made? I'm on pair number four right now. It remains to be seen if I can manage another perfect photo shoot like the first three but I'm loving getting pics of all the socks from the same perspective. Totally fun. It's still freakin' hot as blazes in Austin. The only projects that can be knit in this heat (without massive A/C blowing) are small and light. Nothing that will sit in your lap, nothing that puts a single extra fibre on your body. That's why socks are the perfect Texas summer knit and that's why I've finished my second pair in 3 weeks. I started these on the plane after we left Dallas, finished the first sock just after landing back in Austin and knit the 2nd sock last week. I knew if was going to continue to knit this many socks, I'd have to invest in a pair of sock blockers. That is until I stumbled across a tutorial to make your own out of wire hangers. Brilliant! (And economical!) They're not pretty (hence the lack of a photo) but they work perfectly. 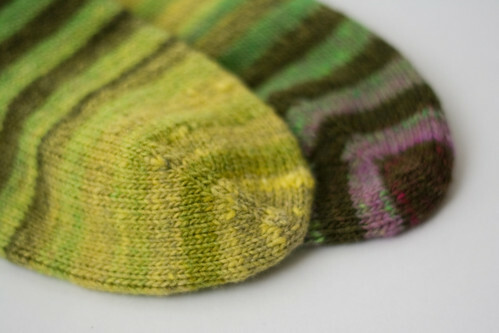 I'm debating sending the tutorial with the socks to their new recipient north of the border. Pattern: None really, just some ribbing, a heel flap and a round toe. Yarn: A much coveted and fondled hank of Julia's Vesper Sock Yarn in the Crew colourway.